A beautiful resort town set up in Red Sea in Egypt, Hurghada is a key tourist attraction in Egypt and also attract s the business travelers of Cairo. This egyptian city draws a large number of tourists in Egypt with its resort beauty and beach activities. Car hire in this town lets you easily drive around the city. Hurghada is connected with other Egyptian cities through Hurghada International Airport. When staying in Cairo or Luxor, fly down to Hurghada, hire a car and enjoy a memorable vacation in the breathtaking environment of red sea. Divided into three areas, Hurghada sightseeing is spread across a Downtown El Dahar, El Memsha and Sekalla. For water sports lover, Hurghada's beaches give you activities like windsurfing, jetsking, snorkeling, para sailing and scuba diving. When you hire a car in Hughada, you can also drive to nearby areas like Sharm El Sheikh and Qena - Hurghada to explore their attractions. Resorts nearby Hurghada to be explored are Al Quseir, Soma Bay, Al-Mahmya, Sharm El Naga and El Gouna. Hurghada is a perfect Egyptian destination for business travelers looking forward to enjoy a leisure day and for families seeking beach holiday. With a stunning coastline and relaxing beaches, Hurghada lets you have a great time in Egypt. 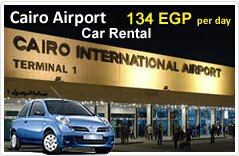 Egypt Car Rental is an expert car rental firm with a reputation of providing travelers with easy to book cars on rent service. SUVs, economical cars, sedans and mini cars are included in our fleet for you to pick. Driving around in a city like Hurghada with a car on rent means convenience, comfort and affordable commuting. Our car hire facilities is full of benefits like secure online booking, easy registration, variety of cars and huge list of popular pick up and drop off points.